You're a zombie called Kem. Your wife Val has been kidnapped by evil forces and he must rescue her! You have to go through dangerous levels, explode boxes, and avoid the dangerous obstacles on your way to the goal in this game about real love. Can you do this? Is very interesting adventure that will captivate your attention all the time when you're playing! Zombie Kem had a quiet life with his wife Val, before she has been kidnapped by evil forces. Make a great trip and help him realize his plan to save his beloved wife! In this adventure game developed by FreeWorldGroup you are traveling through a large map with many levels. Tips and suggestions are given during the game. Sometimes, levels seem impossible to pass at first. But you must keep trying! If you do not know how to pass a level, you can restart it and try to pass this level again. The difficulty of levels in this game will grow progressively. So, you have to show all your skills to pass them all. Kem and Val are already waiting for your help? Are you able to do this? 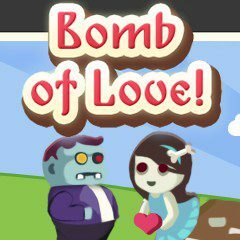 Games Similar Bomb of Love!